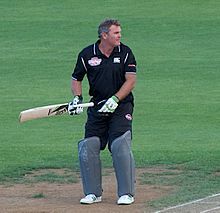 ↑ Martin Crowe – CricketArchive. Retrieved 3 March 2016. ↑ Dave Crowe – CricketArchive. Retrieved 3 March 2016. ↑ Jeff Crowe – CricketArchive. Retrieved 3 March 2016. ↑ "How a young Martin Crowe caught the Herald's eye" – New Zealand Herald. Retrieved 3 March 2016. ↑ London Gazette (supplement), No. 52768, 30 December 1991. Retrieved 8 January 2013. ↑ (13 December 2008). "Wedding bells for Crowe and Downes" – The Sunday Star-Times. Retrieved 3 March 2016. ↑ "Roseneath: Crowe's nest" – New Zealand Herald. Retrieved 3 March 2016. ↑ Milne, Rebecca. (15 February 2009). "One flew into Crowe's nest". The New Zealand Herald. Retrieved 19 January 2013. ↑ Statsguru: Martin Crowe, Cricinfo, 3 March 2015.